A revelatory, thrilling and emotional journey behind the scenes of Blue Note Records, the pioneering label that gave voice to some of the finest jazz artists of the 20th and 21st centuries. 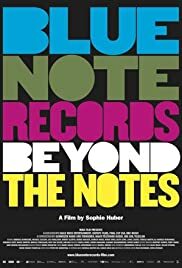 The second documentary after her critically acclaimed HARRY DEAN STANTON: PARTLY FICTION, BLUE NOTE RECORDS: BEYOND BLUE NOTES is about the record label company called Blue Note Records and the artists mainly jazz musicians that played on the label. The founders are apparently still alive and they are seen in archive footage together with their artists they signed on. The question is what is so special about Blue Note Records. Director Hubert is clear to let her audience know. For one, it is a label that the owners sign jazz musicians on because they love their music. Making money is only the secondary reason. An example is the commitment one of the owners had for jazz (or alternative) pianist Thelonious Monk. It took a while before people liked and got familiar with his music and the owner believed in the man and his music. Other artists that made Blue Notes Records their home include Miles Davis, John Coltrane, Bud Powell and Art Blakey, as well as present-day luminaries like Robert Glasper, Ambrose Akinmusire and Norah Jones. The founders are just as interesting as their company. The company was founded in New York in 1939 by German Jewish refugees Alfred Lion and Francis Wolf who fled the Germans. If, the history of Blue Note Records goes beyond the landmark recordings, encompassing the pursuit of musical freedom, the conflict between art and commerce and the idea of music as a transformative and revolutionary force. The film also includes an impressive cast of interviewees: Ambrose Akinmusire, Michael Cuscuna, Lou Donaldson, Robert Glasper, Robert Glasper, Derrick Hodge, Norah Jones, Keith Lewis, Lionel Loueke, Terrace Martin, Ali Shaheed Muhammad, Kendrick Scott, Wayne Shorter, Marcus Strickland, Rudy Van Gelder, Don Was.